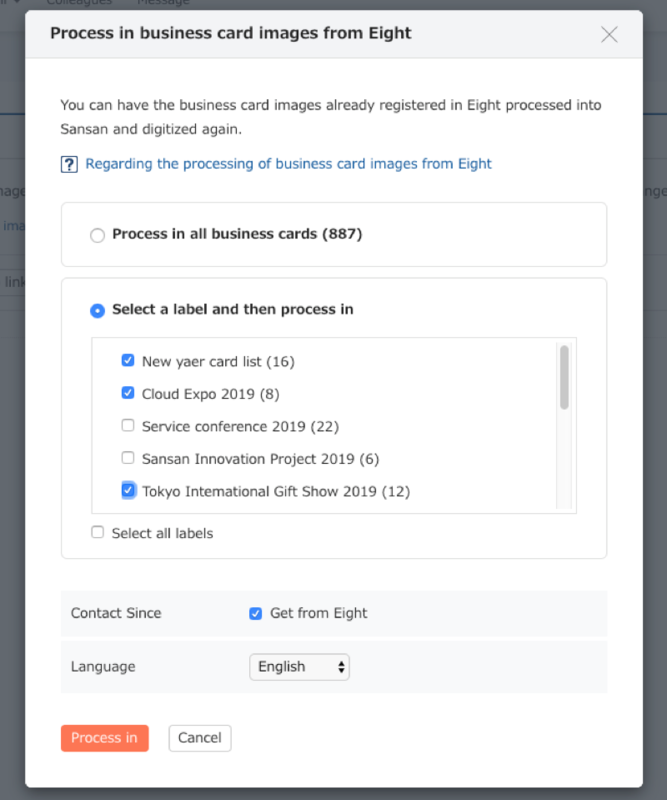 If you use the business card app for individuals, Eight, you can have the business card images in Eight processed into Sansan and redigitized. The processed-in business cards will be redigitized by Sansan and shared with your colleagues in your company. Please use this after checking to see if the cards you wish to process in are appropriate to share with your colleagues. Each card will be counted towards your monthly limit in the same way as when you scan cards or take pictures of them with your smartphone. 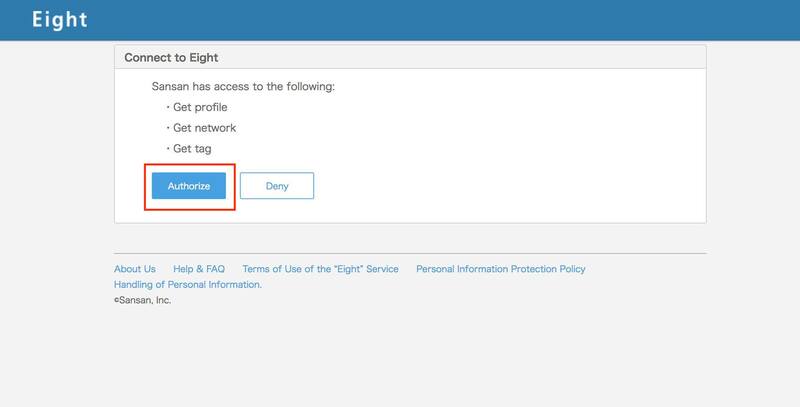 From the External service linking screen of the Administrator settings (*), please enable Eight linking. * This is a screen that can only be used by system administrators. 2. Attach a label to cards you wish to process in. To specify which cards you wish to process into Sansan, please create a business card label for this in Eight. 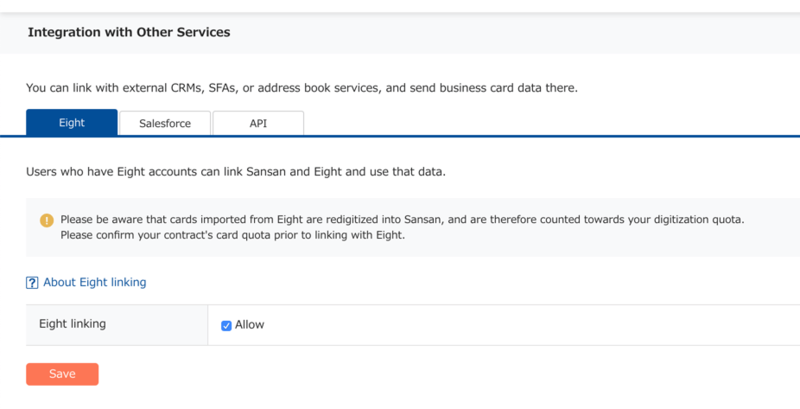 You will use this label to specify which cards to process into Sansan. For how to use labels in Eight, please see here. From the Eight screen of User settings, you can link with your Eight account. When you click the "Link" button, the log-in screen of Eight will come up. Please enter your account information and then log in. When the log-in is successful, the following screen will come up. Check the contents displayed, and then click on "Authorize". 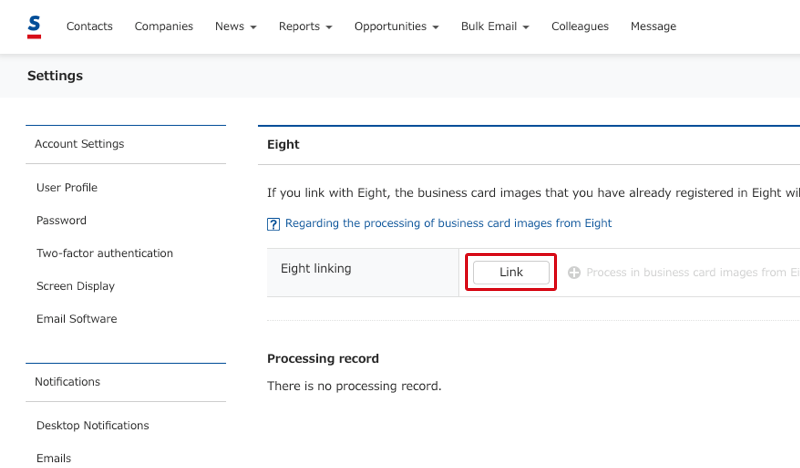 When the connection with Eight is complete, click on the link "Process in business card images from Eight". Select the label you attached to business cards in Step 2. The cards with this label attached to them will be the ones processed into Sansan. When the input language has been set and you click the "Process in" button, the process of bringing in the images and digitizing them will begin. Will there be a charge for processing in business cards from Eight? Our data input staff will change the images into data, so this will use some of your digitization limit in the same way as scanning in from the Sansan scanner. Depending on the contract you have, if you exceed the limit for digitization, an extra charge may result, so please use this after checking how many more cards you can have digitized. How long will it take for the images to be changed into data? 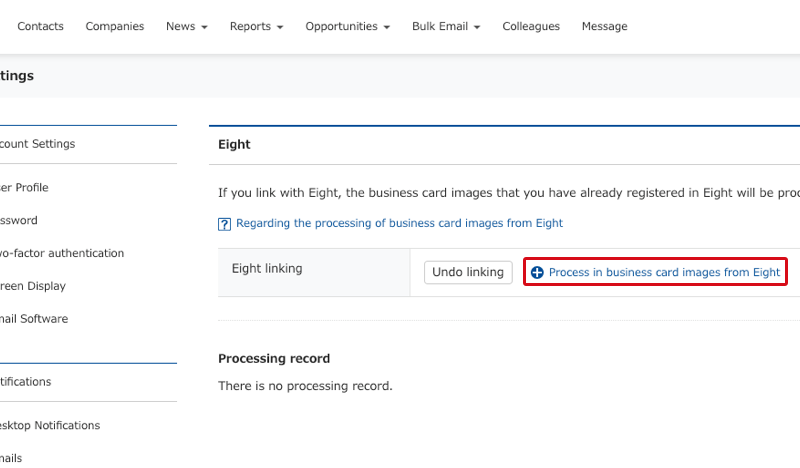 Depending on the number of cards you and other users are processing in, please understand that it may take some time to change all of the images into data.